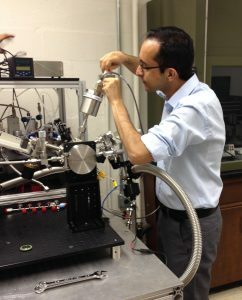 Hossein Salami working on the NASA-sponsored atomic layer deposition reactor system in the Semiconductor Material Processing Laboratory. Hossein Salami, a ChBE Ph.D. student in Professor Raymond Adomaitis' (ChBE/ISR) Semiconductor Material Processing Laboratory group, won first place at the University of Maryland's 2017 Graduate Research Appreciation Day. The prize was given for his presentation “Using reaction network graphs to study the dynamic behavior of chemically reactive systems: Application to chemical vapor deposition processes.” Salami’s talk was part of the Energy and Technology session of the event. His work focuses of chemical reaction network analysis for ALD and CVD processes and is supported by the the CBET division of the National Science Foundation. Salami recently defended his Ph.D. thesis proposal, A mechanistic framework for reaction network analysis of atomic layer deposition processes with application to titania thin-film manufacturing.